Lawsonia is home to two championship courses, The Links (pictured) and The Woodlands. This may come as breaking news to some: Lawsonia will be hosting the U.S. Open. No, not that U.S. Open. The U.S. Hickory Open. September 23-25, the Society of Hickory Golfers will descend on Green Lake, Wisconsin, to hold its annual championship. For three days, participants wearing knickers, ties, and newsboy caps will be wielding wooden-shafted clubs and using balls fashioned pre-1935. The tourney – and Society for that matter – pays tribute to a bygone era in golf which makes the Links Course at Lawsonia a fitting host since its design is a true treasure for public golf in the Midwest. Lawsonia actually is a 36-hole property – hence the moniker “The Golf Courses of Lawsonia” – in the middle of Wisconsin. The 18-hole Links (1930), however, is its fabled layout having played host to Ben Hogan, Byron Nelson and Sam Snead during its early years. Credit for the distinct features on the Links goes to course architects William B. Langford and Theodore Moreau. Their names can be seen on a rock alongside the first tee. 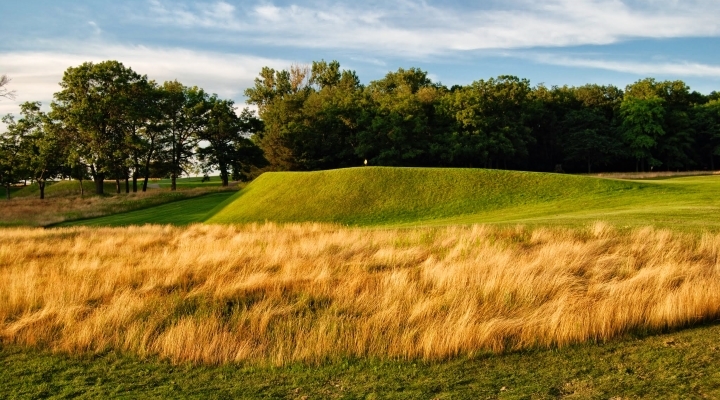 Inspired by the look of Scottish courses, the duo set out to create that vision on a basically treeless plot of rolling land where the wind could whip not far from what is Wisconsin’s deepest inland lake (according to the Green Lake Chamber of Commerce). Luckily, several staff members at Midwest Golfing Magazine (MGM) have – with multiple shots out of the same bunkers and several three putts as memories. But as difficult as some of the short-game shots can play, a well-thought out approach and well-placed shots can lead to good scores. The Links can play up to 6,853 yards from the tips – modest by modern standards – and it intentionally allows for run-up shots. The first hole, a banana-shaped par-4 (418 yards), is a good example of what lies ahead. The teeing ground at No. 1 blends into the fairway which offers a mainly blind landing area. Only experienced players will know the line as a narrow fairway bunker juts out into the fairway and is hidden about 150 yards from the green. Ahead at the green is an area in front to run up an approach shot. Steep drop-offs to the left and back of the green make for some of the most daunting up-and-down shots on the course. The greens on the Links have bold contours and are large and defined (circles and squares), a product of the old push-up method of building putting surfaces. The perched green at No. 7, which plays downhill from the tee, is one of the most talked about with a front and right side drop-off steeper than No. 1. Supposedly a railroad boxcar is buried underneath the green which would make sense to those who have missed the green. Putting is often the key to securing a good score on the Links. There are large swales or sections on many of the greens that have to be navigated. A similar strategy applies with the bunkering. As Lyons pointed out in an interview with MGM, the bunkers are all flat, a superintendent’s dream for upkeep. But the hazard part for golfers is that almost all of them are fronted by grass mounds or walls making for challenging recovery shots or often times a punch-out from a fairway bunker. Langford and Moreau’s philosophy was to build great holes at no expense to the routing which may explain the stretch from No. 9-14 that alternates par-3s and par-5s. Hole No. 10 is a 239-yard brute which has a fairway bunker – yes, a par three with a FAIRWAY bunker – that plays with a golfer’s depth perception. Hole No. 13 is perhaps the most magnificent par five on the property with a sharp uphill finish just to make final 100 yards a little harder. Over the past several years, to return the Links to more of its intended look, clusters of trees were removed around the 13th green and on the 14th hole (a 154-yard par three). That has dramatically helped the health of the greens and other areas on those holes while opening up stunning views of the back nine which highlight more of the remarkable green complexes. Lawsonia has also gone to other detailed lengths to restore its glory included a classic, shielded logo and simplistic hole signs at each tee box. The 19th hole in the clubhouse is named Langford’s Pub. According to Lyons, it holds a framed old blueprint of the Links. Lyons also said that some of the grass depressions on the course that play like bunkers may have had sand in them at one time (at least nine holes have this). And many of the bunkers, with or without sand lie some 20-60 yards from the green, locations more befit of a different era of golf where shots along the ground might have been affected. Take note, U.S. Hickory Open participants. Don’t Forget About The Woodlands Course, Too! Lawsonia’s other course – the Woodlands – came along more than five decades after the Links Course. It plays more parkland style through a heavily-forested portion of the property closer to Green Lake. Golfers often hear the bells of historic Judson Tower behind the green at No. 2, the middle of a great three hole stretch to start the round. Make no mistake, the Woodlands is its own course, a sharp contrast to the Links. For more information on all that Lawsonia has to offer, visit www.lawsonia.com.